Did you know that green plants are more than just aesthetically pleasing to the eye? Their benefits range from reducing stress, to improving productivity, and even cleaning and purifying the air around us — much like our home cleaning packages! Many plants are ideal to help keep you and your family both happy and healthy. Here is a collection of some of our favourites. If you’re looking for something hearty, colourful, and perfect in a centrepiece the garden mum is for you! You can grow them outside and bring them in to help rid the air of pollutants like benzene, formaldehyde, ammonia, and xylene, or pick a pot up inexpensively at your local garden store! We love this plant, as it’s easy to grow and hard to kill! It thrives in bright yet indirect sunlight and helps to cleanse your home of formaldehyde and xylene. These plants are easy to clone. Cut a piece and watch it grow in other areas of the home! Similar to the spider plant, the snake plant is a resilient beast that requires little TLC. Occasional watering and some sun keep this purifying plant on the rise. While this plant is great for removing all kinds of pollutants, including benzene, formaldehyde, trichloroethylene, and xylene, and it looks exotic and tropical, be wary, as they are toxic to dogs and cats if eaten! Pet owners should stay away from this varietal to protect their four legged friends. If you are looking for something that will fill a larger space with some height, consider the Ficus or Weeping Fig, as it can span up to 10 feet tall! It loves bright and indirect sunlight and removes the pollutants, including benzene, formaldehyde and trichloroethylene. This hardy plant thrives indoors with little maintenance as well as outdoors after temperatures rise in the spring. If you are looking for a delicate and fragrant flower that powerfully removes most toxins and pollutants, try the peace lily. They prefer shade and moist soil. One of the most versatile houseplants around is the aloe vera plant. It filters the air, improving respiration, and its healing centre helps after-sun care, wounds, and boasts both antibacterial and anti-inflammatory properties. Get your Zen on with bamboo palm. This mighty plant can filter with fervor, as it has the ability to grow rather tall. 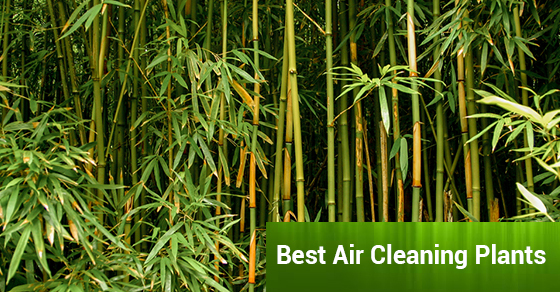 These plants are only the start to a clean and healthy home. Be sure to call us to inquire about our home cleaning packages tailored to your family’s needs.